Summer to me is all about the red, white and blue. It brings to mind images of sand and sun, small town parades, ice cream and baseball. One of my very favorite fabric lines is Cottage Romance by Maywood Studios. The line debuted a few years ago and I bought a lot of it. I found the fabric and pattern, the other day, for the quilt in the first photo and quickly set out to make it. 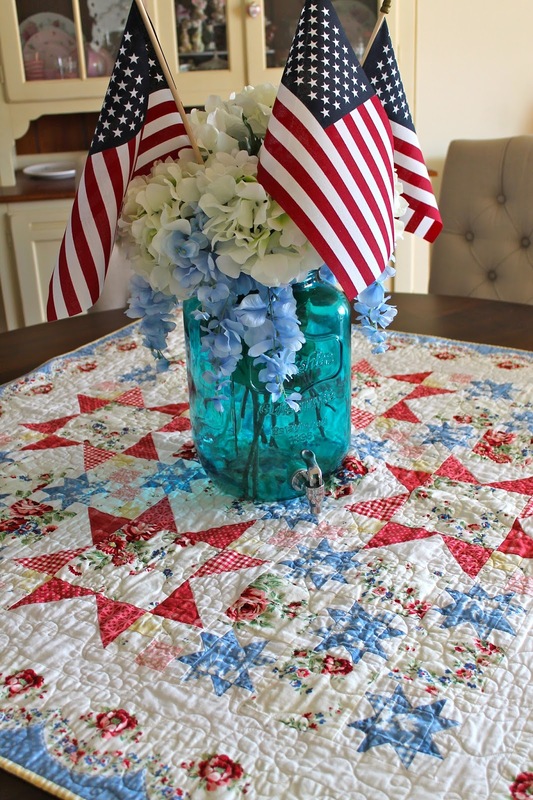 I knew it would look great hanging next to it's sister quilt which covers the dining room table. The rest of the house got some patriotic touches too. My Mom made the cross stitch for me awhile back and it found it's place on the wall across from the entry way church pew. I love walking by and seeing this everyday. The mini quilt above the pew was a gift from Amy of A Quilting Sheep. The quilt ties in so nicely with the pillows. In addition to quilting I have been knitting up a storm. 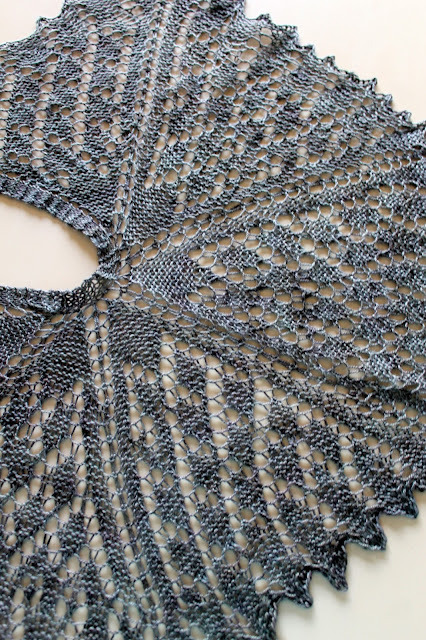 This lace shawlette is for my Mom-in-love, a belated birthday gift. Lace is not my favorite to knit but I certainly like the outcome. I hope you are having a lovely week! I love the table quilt. Those fabrics are pretty together. My favorite colors year round but especially from Memorial Day to Labor Day. I call it the longest decorating season. Red, White and Blue covers all the holidays during that time and summer too. Love all yours, especially the first one. The colored water in the Mason jar is a favorite too. Happy summer! 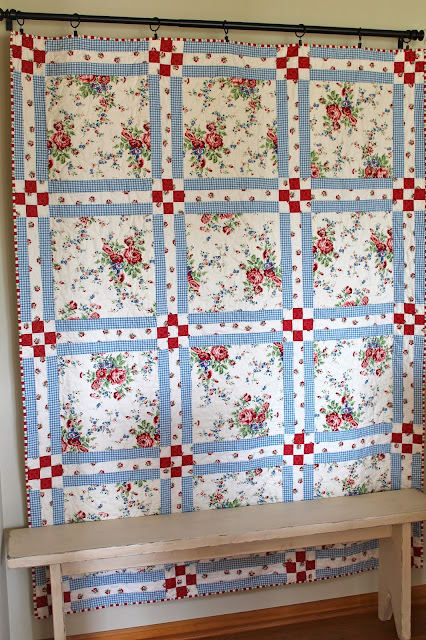 Beautiful, the fabric in the first quilt is a real delight. You are certainly blessed with a beautiful home. It's been ages since I've been by your blog. 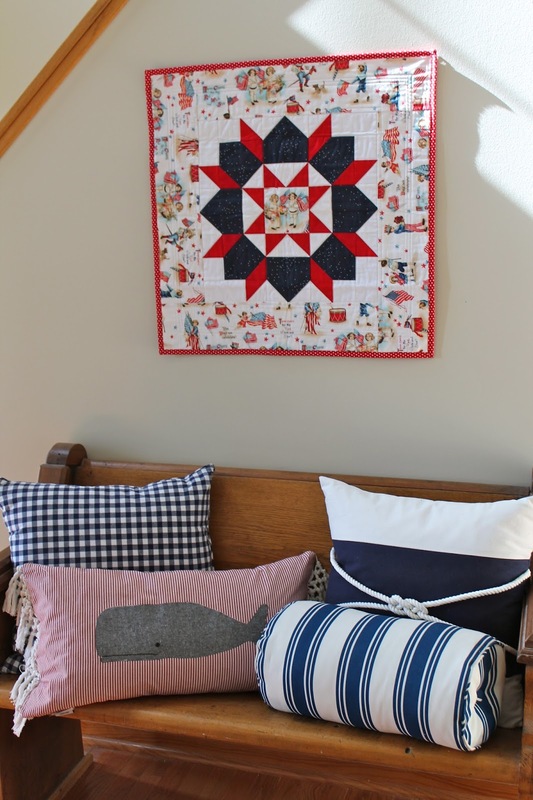 I love the colors in this post, and that quilt at the top is inspiring me to get back to my sewing room!